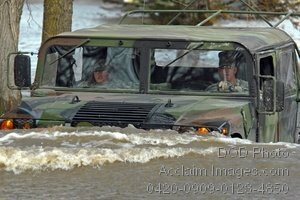 Description: Free, public domain image: Soldiers Driving a Humvee on a Flooded Road at Fort Ransom, ND. U.S. Army Staff Sgt. William Griffin, with the 136th Combat Sustainment Support Battalion, drives a Humvee on a flooded road in Fort Ransom, N.D., April 15, 2009. Griffin and Spc. Jessica Sandberg, with the 132nd Quartermaster Battalion, are making a welfare visit to a rural civilian whose home is surrounded by water. (U.S. Air Force photo by Senior Master Sgt. David H. Lipp.